In 1996, Kriss Worthington, as a first-time candidate for the Berkeley City Council, was a guest on the Berkeley community cable TV program, “Prime Exposure”. That was twenty-two years ago today, on September 19th when Kriss sat down to share his thoughts on the upcoming elections and his candidacy. He also addressed the town-and-gown issues surrounding UC Berkeley and emphasized the importance of building coalitions within our community. This will be remembered as his greatest political achievement. Few citizens who have been elected to Berkeley government have worked as hard or have made as great a contribution to bring our community together. District 7 Representative Worthington is scheduled to vacate his council seat at the end of the 2018 term. 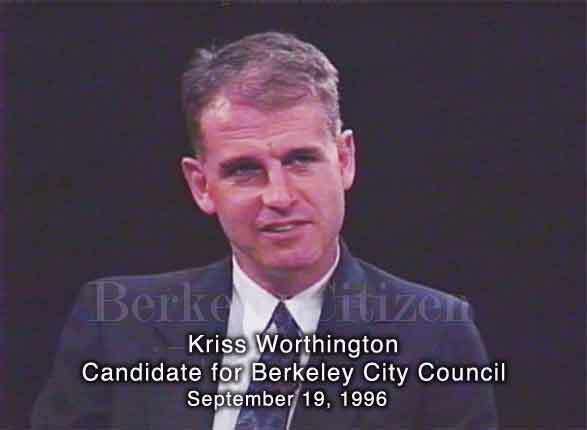 In 1996, Kriss Worthington, as a first-time candidate for the Berkeley City Council, was a guest on the Berkeley community cable TV program, “Prime Exposure”. With all precincts counted, challenger Kriss Worthington defeated the six-year incumbent by a vote of 1,704 to 1,488 -- or 53.4 percent to 46.6 percent. City workers must still count about 75 last-minute ballots dropped off before the 8 p.m. deadline, but they will not change the outcome. "I think our district is very lucky that we had three highly qualified and talented candidates to choose from," he said. "I'm looking forward to working with them and other residents of the neighborhood." The runoff, Berkeley's first all mail-in election, was held because neither candidate garnered more than 50 percent of the vote in the November 5 general election in order to win outright. Worthington finished that race with 2,450 votes, or 49.5 percent, to Woodworth's 2,048, or 41.3 percent. A third candidate, Sheila Holderness, got 449 votes, or 9 percent, preventing either candidate from claiming a majority. Voter participation from the 12,000 voters in the district was expected to be low, especially among University of California at Berkeley students, who are busy with final exams. Many thought low student turnout would work in Woodworth's favor because much of Worthington's support came from campus. However, a push by Worthington, a former student cooperative housing manager, seems to have paid off. "We concentrated a lot on the tenants and students" for the runoff, said Worthington campaign manager Jeff Hoogs. "We're out there driving the people to the city clerk's office who haven't voted," Hoogs said. "We have a unique 'Kriss Taxi' service." After conceding the election last night, Woodworth said she planned to work full time on health-care reform. "I appreciate the opportunity I've had to give community service to the city of Berkeley for the past six years -- I've met a lot of good people," she said. Much of the campaign focused on who would best work with the council's new progressive majority. The balance of power had already shifted to five progressive votes versus four moderates with the election of Margaret Breland, who ousted Mary Wainwright in District 2. The only question that remained was whether the fifth progressive would be Woodworth or Worthington. Worthington's campaign accused Woodworth of abandoning her progressive roots, a charge Woodworth denied, saying she retained many progressive endorsements. Worthington positioned himself to the left of Woodworth, saying he is more supportive of tenants and low-income housing. Woodworth cited her record helping to revitalize Telegraph Avenue and the Elmwood neighborhood shopping district and securing more funding for parks.